This is Nissan’s second attempt to build a new London cab, and as with the 2012 effort this one’s based on the Nissan NV200 van. These first official pictures show a revised Nissan NV200 that’s been worked on by a UK based design team. The new machine goes on sale in December 2014 with an electric version to follow in 2015. Nissan’s European design centre team who were responsible for the Nissan Qashqai and the Juke are the ones behind this creation. They’ve taken inspiration from taxi drivers whose initial feedback was that the new taxi looked too much like a van. Taxi drivers were concerned that they’d be ignored by punters on busy city streets driving the new cab so the designers went back and revised the new machine to give it a friendly and more appealing look. A new grille and a reworked front bumper distinguish this from the van on which it’s based, but to us the looks are a little bit too futuristic and far too bug-eyed. It also looks like the sort of vehicle that you might be taken away in after an arrest rather than something to get you home after a great night out. 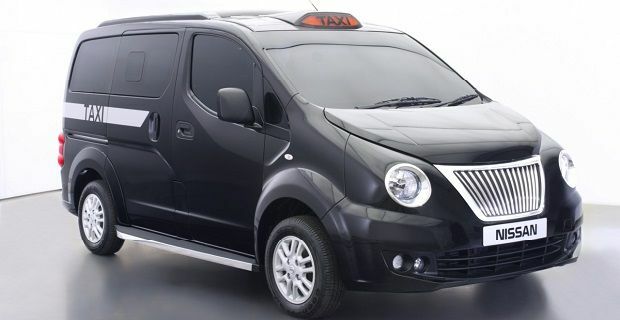 According to Nissan the new taxi is supposed to “epitomise everything that a black cab should be.” Perhaps if Nissan’s plans to flood London’s roads with the NV200 come to fruition the new cab will fulfil its remit. If you think that’s ambitious, then you’ll be amazed that Nissan plan to sell 140,000 units per year across the world. The traditional black cab, which let’s face it won’t disappear from London’s roads, has only sold that number since it was introduced in 1948 so this NV200 will need to be picked up in quite a few markets to generate the sales Nissan want to achieve.